“We need more enrollments,” says the college president or chief financial officer or take your pick. No problem, you may be thinking, in light of the fact that tuition has been raised – again – and there are areas of the institution that are in need of let’s say “enhancement in quality.” What’s an enrollment manager to do? Information from our recent national study provides the answer. The perceived value that a student attaches to your institution correlates strongly with his or her likelihood of enrollment. 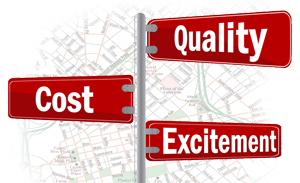 Perceived value has three components: perceived quality, cost and excitement about attending. A change in any one will impact your total perceived value score which, in turn, impacts enrollment. The perceived quality of a college may be more or less important from student to student although it may be safely assumed that it is universally important. Cost is also important. These two factors, however, do not have as strong an influence on enrollment as does the student’s excitement about attending the college. Students may find colleges of higher perceived quality and lower cost than others under consideration but if their level of excitement about attending is low then they are significantly less likely to enroll. Of the three components, cost is likely to be the hardest for a college to change. Its published sticker price may be flexible through discounting but in all likelihood tuition will continue to rise. Real and perceived qualities are changeable. However, both take time, require internal collaboration, and demand adequate resources. The single component in the value score that is most flexible and impacting on enrollment growth is student excitement about attending. It is more strongly correlated to enrollment – by a factor of two – than either cost or perceived quality. This was one of several surprising findings revealed in Longmire and Company’s latest nationally co-sponsored study, “Your Value Proposition: How prospective students and parents perceive and select colleges.” Click here to download a copy of the report. Generating excitement is a multi-dimensional process and should involve everyone on campus. It may entail building and communicating a brand that attracts individuals with similar interests, putting students in the company of others with similar passions, providing opportunities to work closely with faculty, offering prompt and attentive customer service, having a unique energy and atmosphere on campus, and any number of other attributes that strike an emotional chord with a student and parent. Creating excitement is in the wheelhouse (or should be) of the admission office and admission counselors. However, many people working in admissions don’t know how to create the level of excitement that it takes to win an emotional commitment from the student that will lead to enrollment. This problem usually arises because the department or counselor spends too much time selling the institution rather than trying to understand what the student sees and feels as being valuable. The answer to increasing enrollment in the face of tuition and quality challenges lies in taking an entirely student-centric approach to recruiting where the admission office and counselors realize that “it’s not about the institution – it’s about the student.” This is powerful when put into practice. Through our Interactive Training Workshops for counselors, we spend a great deal of time changing the focus of admission counselors. We see their transformation and improvements in productivity. Most importantly, we see changes in the recruiting process that exposes students to the information and experiences that truly interest and excite them. Talk about a surprise. We had just concluded data collection and were beginning the analysis on Longmire and Company’s latest national co-sponsored study. This one dealt with “the value proposition” and examined how prospective students and parents form their value perceptions and select colleges in the current economy. In the study, we were interested in quantifying the value that students and parents attach to higher education in general and, more specifically, to the colleges they were most seriously considering for Fall 2013. Based on the rising cost of higher education, the increasing frequency of media reports on the topic, and the discussions of industry insiders, we expected the data to show that a paradigm shift had indeed taken place and that “outcomes” would be revealed as a primary driver of college selection. Not so. The data revealed that students and parents are selecting colleges in much the same way as they have in the past. They are most concerned about what life will be like when they step on campus on the first day of the first semester. At that point, they are much less concerned about what their life will look like four, five, or six years down the road. In truth, many students enter college having no clue about what to study. And among those who do a sizable percentage will change majors at least once during their time in college. The study revealed that less than one-third of students enrolling in the Fall of 2013 said that the expectation of salary after graduation played an extremely important role in their college selection decision. So, what do students and parents value most when selecting a college? The study did a deep dive on this. It’s critical to recognize from the outset that the determination of value is highly personal. A commonly held belief founded on much research and testing suggests that people arrive at a perception of value through a mix of three components: the perception of the quality of the product or service, the cost to own it and its return, and the excitement about having and using it. The weight of each component is inherently equal and changed only when put through the blender of the human decision-making process. Taken together, these three components add up to a total value perception. We believe this process of value perception formation and decision-making applies perfectly to higher education. A thorough analysis of the data from this study (over 7,400 responses were collected nationwide) shows that an overall value perception score has a strong positive correlation to likelihood of enrollment. So does each component by itself. That’s not shocking. What we found most interesting is that the student’s excitement about attending the college is much more strongly correlated to likelihood of enrollment (by a factor of two) than is cost or perceived quality of the institution. The study found that approximately 70% of parents and students bound for four-year colleges say they would reconsider a college that they initially believed to be too expensive if it could demonstrate greater value. When asked to specify in their own words the added value that would be required to mitigate the additional cost, most suggested added values that had nothing to do with money. No doubt, the cost of higher education has risen dramatically for more than a decade. It seems logical that colleges would attempt to soften the public and political criticism by more effectively communicating value delivery. Unfortunately, this is not happening. Most importantly, it is not happening in the conversations between colleges and the students they are attempting to recruit. Only about 20% of students and parents recall having any conversation in which the college they were most seriously considering explicitly addressed how the college planned to maximize their time and investment as a student there. Just one-half of students and parents indicated that they were “very confident” that the money they will spend the first year of college will be worth it. We will address the findings and implications from this national study of value and value perception in upcoming blog posts. To download “The Value Proposition” report or copies of our previous national co-sponsored studies, click here.